It rained quite heavily this evening in the Lower Mainland and it led to flooding in many parts of Vancouver. I had to drive to dinner and it was torrential rain with low visibility in many parts of my drive. Once on foot, I was amazed at the amount of leaves in the street and on the sidewalk. There was a thick, mushy layer of autumn leaves just padding the ground. This probably explains all the blocked drains leading to the flooding. The rain is supposed to stop overnight but showers will return for Monday. The forecast is for rain and showers for the next ten days! There’s a guy at work who has a mullet hairstyle. It looks awesome. He pretty much looks like Jagr in the above picture but better. He’s also shaved the sides of head, not down to the scalp, but enough so that it accentuates his free-flowing mullet. 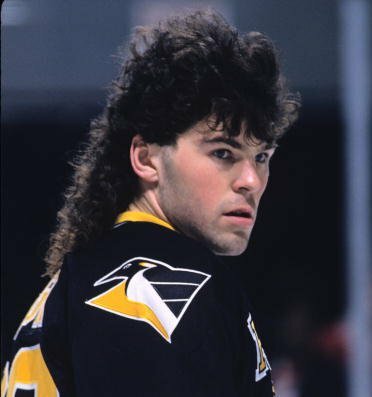 There’s no way he doesn’t know he’s grown this awesome mullet, you kinda have to know what you’re doing to get it like that. It’s no accident. Perhaps he’s doing it for fun or he’s going for that retro look. I’d say if he sported that mullet fifteen years ago, it probably would have gotten more negative reactions. Enough time has passed now that mullets have reached retro status. It’s no longer out of style, it’s just a style that popular a long time ago and you can probably wear it ironically now. Anyways, it takes a certain braveness to have a mullet still and I salute this gentlemen for having the courage to look so good. The official today was 14 degrees Celsius but it sure felt warmer that that. The sun was out all day and it was a very pleasant Sunday. I was out in shorts and a t-shirt this afternoon and the sun felt warm on my skin. It wouldn’t take much physical activity today to work up a sweat. I wandered down to the local park by the river front where the sun was bright and shining. I saw people in coats and I felt a bit sorry for them as it seemed like they were a bit uncomfortable in the warm sun. We’re a week and a half away from the beginning of November and I’m still gallivanting around in shorts and t-shirts. I guess I’m not complaining but it is warmer than average this month so far. I wonder if this is a taste of things to come due to climate change. On my way out of Las Vegas back home, I was quite early for my flight, so I again opted out of the body scanning machine used by the TSA. I can’t remember the last time that I didn’t opt out. Some people complain that when they opt out, they are harassed by TSA personnel but I can only give you my experience with this. I have only been treated with courtesy and professionalism. I never felt like I’ve been punished for choosing to opt out, for example, making you wait a long time before someone can manually pat you down. I believe two minutes has been the longest I’ve had to wait for a TSA dude to do the pat down. The examination is also consistent across personnel and airports. They always do it in the virtually in the same order and in the same manner. I always know what to expect when they pat me down. It’s the same “back of the hand” brush across my “sensitive” areas, checking my feet, and the weirdly comfortable back “massage” they give me. Some people get really offended by the nature of the exam but if the TSA intends to know if you’re smuggling or hiding something in your groin area, they’re gonna have to do something to figure that out, there’s no getting around that. Personally, I don’t think some TSA dude really wants to brush the back of his hand against my junk, so I don’t take any offense. Like I’ve said before, I view it as a friendly and free pre-flight massage before you get on a plane. The week after a vacation sure drags on. It’s only Thursday! Posted on October 18, 2018 Leave a comment on IS IT THE WEEKEND YET? I don’t know how the cafeteria at work does it but they seem to have this crazy way of serving the driest and toughest pieces of turkey in all their culinary offerings. Every single time I think it’s going to be different, I always get bone dry, tough as leather turkey meat. I don’t know why I keep thinking it’s going to change. Today I had turkey bacon club sandwich and I couldn’t even finish it. I got half way through choking down the dry meat before I gave up and just ate the remaining cheese and bacon. I can honestly say, without exaggeration, the work part of my job is having to eat the food at the cafeteria. It’s certainly a first-world problem and something minor in the grand scheme of things but man, you should taste how bad this food is.